Cross Stitcher Magazine’s 2017 Stitchalong. Now as you all know, my SmartCookieSam blog is meant to be about my love of baking and cooking. But baking up until last summer wasn’t doing my health any good. I’m too busy in my day job to make a living from baking (though I would love to do this in an ideal world) but when I did bake I’d find I’d be the champion quality controller! Cue a two stone weight gain! Cross stitch is also a great passion of mine. I started cross stitching when I was in sixth form to help relax me when I wasn’t revising for exams. I’d been lucky that my Nana Margaret (my Dad’s mum) was a keen stitcher and she had showed me how to cross stitch when I was about 8. I never forget the wonderful parcel of red Binca she sent me with lots of beautiful cottons. She taught me a skill for life and has been so therapeutic for me. Definitely mindfulness at its best. Cross stitch helped me relax when my kids were babies and toddlers once they had gone to bed. An hour to concentrate on something which I had an end result to was a joy to me. All at a time when I had given up work to look after my children and my confidence had taken a nose dive. Cross stitch, although wasn’t bringing in the pennies was something I could take a pride in. Fast forward to January of this year and I saw a fantastic project I wanted to do. It’s in Cross Stitcher Magazine and is their 2017 StitchAlong. I’ve never done a StitchAlong before and the idea of stitching a small part every month really appealed to me. The magazine release a small part of the chart every month so by the end of the year you have a complete project. You don’t know what the finished project looks like, either! This StitchAlong is going to be a months of the year wall hanging and the design has been created by Susan Penny. In the January 2017 issue of Cross Stitcher Magazine we were given the January chart and a list of the threads and the fabric needed. The fabric suggested was a pale, delicate dove grey even weave. This looked absolutely gorgeous but I already had some cream even weave in my stash. So rather than forking out for more fabric I stuck with what I already had. The same went for the threads. I used a close match of DMC threads. January 2017- making a start on the Stitchalong. Forgive the messy stitches. My reading glasses had broken and I was stitching in poor light. It took me about three evenings to stitch the January part of the StitchAlong. In early January the February 2017 issue came out with the new part of the chart. Love the reds and pinks we get to stitch to coincide with Valentine’s Day. I had a great idea about stitching the next part in time for 1st February and saving it as a cover picture on my Facebook profile. Didn’t quite happen that way. I can’t remember what I was doing but it didn’t get finished until the weekend after. Must have been a very busy work week I think. The colours aren’t an exact match to the chart ones as I wanted to use up what I had got in my stash. I think it’s a good likeness though. The February one took about three nights to do which I was happy with. 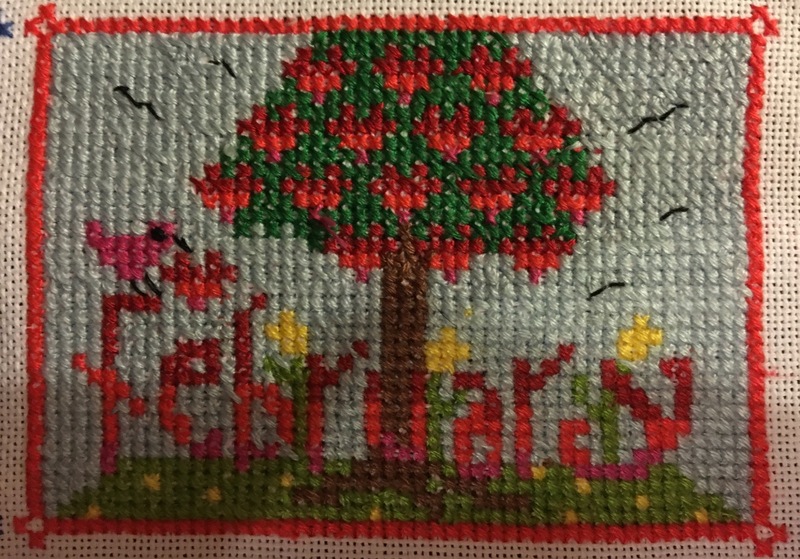 Part two of the StitchAlong is this gorgeous Valentine’s Day tree complete with hearts and bird. It’s always a treat to get the next issue of CrossStitcher magazine! Here is March 2017 bought in early February with the next instalment. Hope this isn’t a premonition of the weather we are going to have in this March! Keep following my progress as I stitch my wall hanging. At the time of typing I’m about to start stitching March’s picture. I’ll add the photos as soon as it’s done. I was meant to updating my progress monthly but you know how it is. I start everything with good intentions but then life gets in the way. I’ve taken photos but not uploaded them onto the blog. Here is my progress so far. I’ve got up to the border of the August picture which I’m looking forward to doing. I’m 2 months behind at the moment but hope to catch up. I’m currently in the middle of crocheting a giant blanket for my nephew so that’s taking up my time at the moment. Previous Post Black Cherry Cupcakes. Next Post Heritage Crafts USA Cross Stitch Map.